Hmmm............. make more jewellery of course! 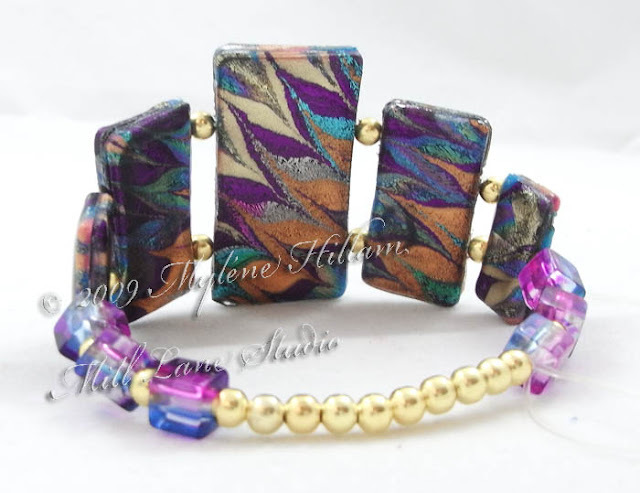 So here's today's eye candy - a bracelet, a necklace and a cuff. 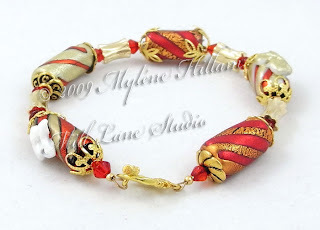 Making simple, strung bracelets is one of my favourite ways to make up twisted beads. 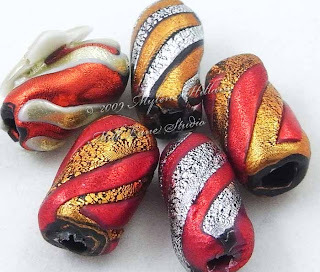 It only takes the addition of a few glass and metal beads to turn the Friendly Plastic beads into something special. This one is called Spicy Tango. Daisy Chain was a little more difficult to create. The colours I'd marbled together were so different to my usual colour palette that it was challenging to find suitable findings to work with it. 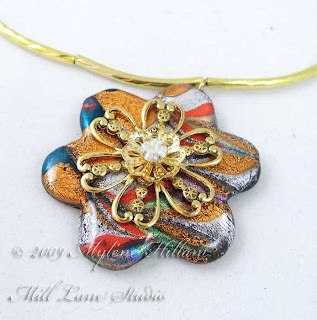 In the end I chose a daisy shaped filigree stamping which complemented the flower shape perfectly. The Swarovski crystal in the centre is a headpin which is threaded firstly through a bead cap, then the daisy filigree and finally, the Friendly Plastic flower. It's sandwiched between the front and back layers and then it becomes the bail. I'm very pleased with the way it came together. 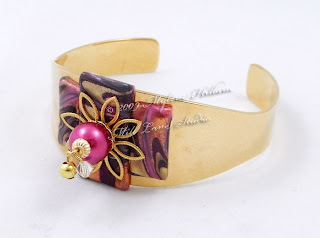 And the last piece for today is pretty gold, pink and burgundy. These colours are so ME! 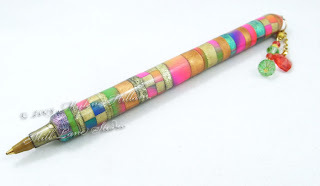 I marbled these colours together with a plastic afro comb - you know the kind... with thick, plastic tines. I coated it with cooking oil first because as you might have guessed, plastic sticks to plastic. The afro comb produced very deep channels but that worked really well with this colour combination as it exposed the pink base of the orange/gold stick. I used an eye pin to connect all the layers together and wired it through the holes in the cuff, tucking it neatly back and forth to secure. A couple of little beads attached to the eye pin of the glass pearl add movement and finish it off nicely. I still have plenty more sample pieces to play with so who knows what might turn up on my blog next. There are still marbled alphabet letters and textured pieces that I haven't even touched and these could yield interesting results, so stayed tuned for a later instalment. 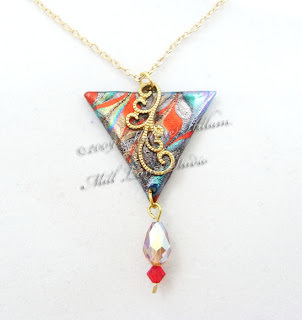 Love the look of fabulous resin jewellery? 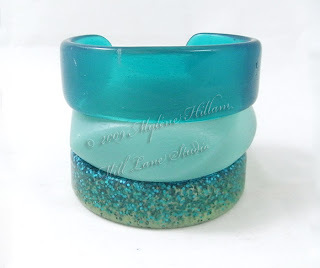 Want to learn all the ins and outs of how to cast your own resin bangles? Want to make your own unique, one of a kind pieces of resin jewellery? Then this 3 hour hands-on workshop might be just the thing for you. 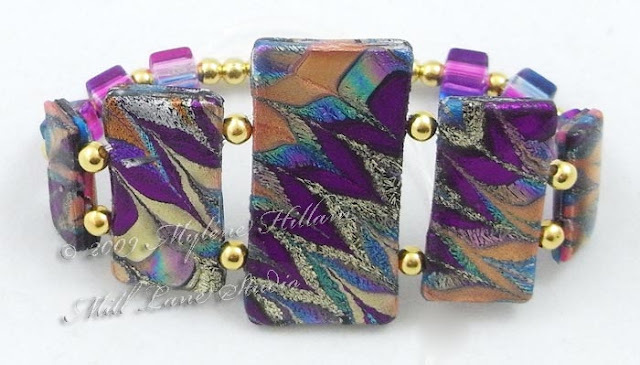 It's not too late to book into the next resin workshop held at Mill Lane Studio in Brisbane this Saturday morning. 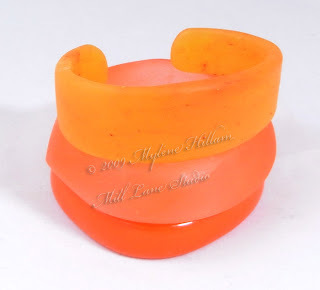 There are still a couple of places available if you'd like to learn the basics of resin casting and bangle making. Packed full of information, this beginners workshop guides you through all the basics of mixing, pouring and finishing your bangles so that they are ready to be worn home at the end of the workshop and all materials and moulds are yours to keep so that you can continue casting at home. Check out my website: Mill Lane Studio for further information and to make a booking. Now the Scrapbook and Papercraft Expo is done and dusted I've begun to turn some of those demo samples into finished pieces so it's eye candy time! All the pieces below are made using the marbling technique and are cut out with cookie cutters. All pieces (except for the first piece) have been covered in resin for durability. 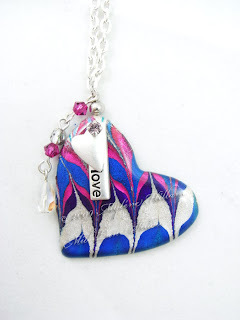 The first is a simple marbled piece which I cut into a triangle shape using a cookie cutter. I've folded a long brass filigree flourish around the front and back and secured it firmly in place. The folded section of the filigree acts as a bail and the addition of a couple of sparkly Swarovski crystals adds a nice touch of glamour. 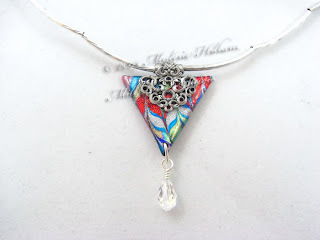 Here's a silver version using a filigree bail attached to the front of the triangle. The necklace is made up of twisted silver tubes threaded on tiger tail and finished and with a crystal teardrop. This heart shaped piece is assembled using a Swarovski crystal headpin to secure the layers together. I've turned it into a bail and wrapped the tail of the headpin around itself to make it really secure and then covered it with a silver bead cover. 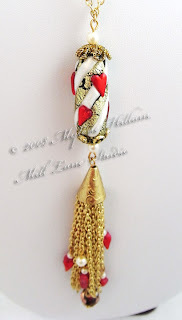 You can see this technique in a tutorial on my website, Mill Lane Studio. The heart and tiny word charms are from the Plaid Fresh jewellery line. I've dangled a few crystals from the bail to add a little more colour. This triptych piece is also made using the Plaid Fresh line. The silver metal enhancer makes a nice frame for the three rectangles which are joined together with tiger tail running through the middle and Swarovski crystals in between. 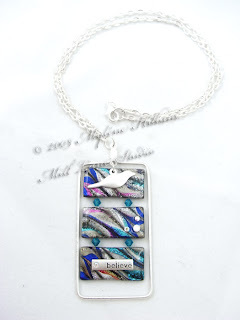 The brushed silver bird and tiny word charms add some nice interest to the rectangles with a few Swarovski crystals for bling. And the final piece is my favourite - I really love the contrast of the colours. 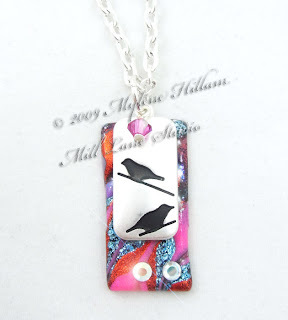 This is a simple piece with just a marbled rectangle for the base, a bird charm from the Fresh range and some crystals for bling. Well I hope you've enjoyed today's eye candy. 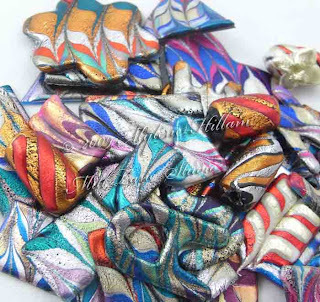 I have many more marbled pieces to make up but they will have to wait for another day! Day 2 of the Scrapbook Expo has already been and gone and I've been kept very busy teaching Friendly Plastic workshops and demoing on the Stamp Antics stand. Even though Friendly Plastic has been around since the '80s, lots of paper crafters are seeing it for the first time and are really excited by this "new" medium. It has been a huge hit with the crafters who have stopped by the stand and Stamp Antics have almost sold out of all the stock they had. But rest assured, there is more on the way. I thought I'd share with you samples of the simple techniques I've been demoing to whet your appetite. Firstly, impress your friends with this gorgeous texture - stamped with rubber stamps or impressed with Krafty Lady Texture Mats and using a frypan as the heat source - gorgeous! These pieces will probably be turned into "Tile Jewellery" so watch out for what I do with them in later posts. Next, marbling with the marbling comb. This is such a fun technique and it has that real WOW factor when you see it happen before your eyes. 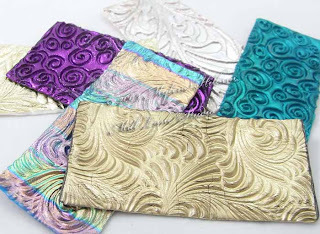 It's like the first time you watched someone emboss with gold embossing powder - it really gets you hooked! From those marble sheets, I cut all sorts of shapes including these fun alphabet letters which would look great on a scrapbook layout or a card front. 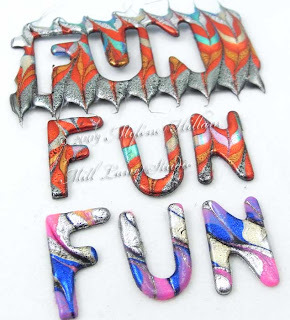 Or turn them into a fun name tag for your next craft retreat or convention. 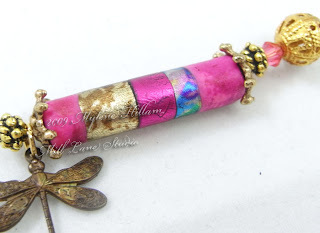 And I couldn't go past demonstrating how to make my "Beads with a Twist". This is a heatgun technique using a skewer to wrap a base strip around with some thin strips of Friendly Plastic laid across the surface and then twisted - surprisingly easy when you know how! These pieces are destined for a bracelet I think. 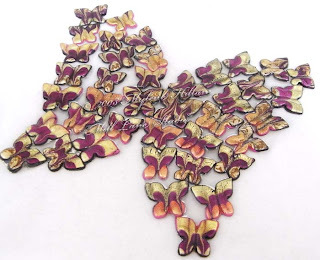 and also the butterflies which made up my "Butterflies in Flight" entry. Tomorrow, I'll also be demoing how to mould with Friendly Plastic using Krafty Lady art moulds as well as all the techniques above, so stop by the Stamp Antics stand and pick up some tips on how to work with Friendly Plastic. 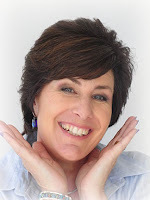 My blogging has been a little bit sparse over the last month as I've been preparing for the Scrapbook Expo this coming weekend at the Convention Centre in Brisbane. If you'd like to see what I've been up to, then stop by the Stamp Antics to catch a demo. I know many of you are unfamiliar with Friendly Plastic as it had all but disappeared from the crafting scene until very recently but it is now making a resurgence with some very talented designers discovering all sorts of new ways to use this very versatile product. You can incorporate Friendly Plastic into your scrapbook pages, cards, off-the-page projects and, my personal favourite, jewellery making! You'll be able to check out my Friendly Plastic pens in person at the stand too (PLUG: Book into the Friendly Plastic Pen class for the weekend following the show if you want to learn my how-to secrets!). And whilst you'll be able to see me demonstrating several techniques on the Stamp Antics stand throughout the weekend, there is nothing quite like learning the finer points in a hands-on classroom situation where you can ask questions and get help as you go along. There are still a couple of places available in my Sunday card making workshop for anyone interested in the hands-on approach. Today is the last day for online bookings so if you're interested you'll need to be quick..... or, you can still book into the class on the day at the Show.